Exchange House national Travellers service is lead partner of Sunia Geel 2, this follows on from the success of Sunia Geel which ran from March 2011 to February 2013. Exchange House National Traveller Service was one of many applicants to the EU Commission’s Fundamental Rights & Justice Section and was once again the only Irish organisation selected to lead the project under the Daphne III Programme‘Sunia Geel’. Sunia Geel derives from the Irish Traveller language, Cant. It translates ‘take care of yourself’ and is viewed as an apt name for what the project aims to achieve. The project goal is to provide a framework to reduce violence against women and children of marginalised ethnic communities and ensure that their safety and support are met. The project will provide an increased understanding of the needs of service users, thus creating the possibility of an improved response. 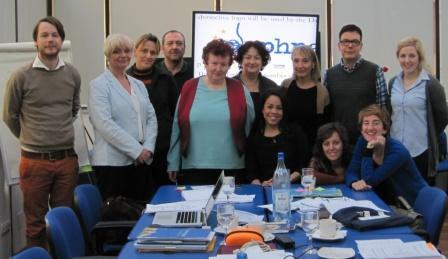 Project partners from Italy, Germany, Romania, Austria & Ireland met in Bucharest, Romania for a three day meeting in March. All partners have worked collaboratively on EU projects in the past. There is a common understanding between partners as they all have expertise in working with minority populations on various issues including social exclusion, DV and poverty. Across the partnerships the target groups are Sinti and Roma, Muslims, Immigrants and Travellers. Exchange House will specifically work with Travellers.